I never - hardly ever - use kite stakes anymore. 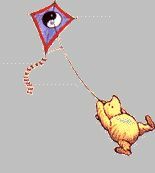 If once you attach the lines, hold the kite from behind, roll the nose back towards you so the lines run over the lower spreaders and over the trailing edge, put the kite on the ground nose forward in the dead launch position into the wind with lines running over the back of the kite. Go to your straps, give them a gentle pull and the kite will roll over into the launch position. This works even in the strongest winds. To avoid loosing anything I tend to keep all my kite stuff in the same backpack, that includes various line sets (UL, short, long and quads), Rev handles, screwdriver (for the Revs only), tripod, camera, sun block, sun glasses and a hat or cap. To avoid loosing my stake (screwdriver, of course) I put it in my pocket every time I grab my handles, it is stuck in the ground only when I'm not flying. A stake is not very usefull if you don't have it at hand when you need to land your kite. As for the kites, I use to carry them in a large kite bag when I go to the flying field with the car, usually carrying a 4D, a set of UL and STD dualies and a set of Revs (STD and Full VTD) to cover almost all wind conditions. If going with the bicycle, I have to be more careful choosing just a couple of kites, usually a STD dual and a full VTD Rev, then I strap them to the frame of the bike using some velcro straps. Exactly like Gerardo said, when you pick up your lines to fly, put your stake (or screwdriver) in your pocket. I've flown with people that just leave it stuck in the ground, and don't understand that. When you land, pull the stake out of your pocket, and stake it down. I never use a stake. Before dualies had stand offs, I'd stake my kite just like a quad. It was pretty much required but now it's not needed.